I've been eagerly awaiting the release of the Watches of Knightsbridge June catalogue since they started teasing some of the upcoming collection over Instagram. These are some of the most eclectic lots I've ever seen, ranging from a Rolex 6036 Triple Calendar from the 1950s (we'll be coming back to that one) to a 1980s Pulsar to a literal briefcase full of Swatches! It's sheer coincidence that all the pieces I've highlighted today are chronographs, however it does beautifully demonstrate just how varied a design can be whilst still having the same function. For more information on any of these watches please visit Watches of Knightsbridge to see the full catalogue. Given the lack of subdials, you could be forgiven for thinking that this isn't a chronograph at all. However this is an example of one of the simplest, yet most effective, dive watch variants. Unless you're measuring something very precisely, it's unlikely that you will use the seconds register on a chronograph. In fact, whilst diving you probably want to be focusing on the minutes remaining in your tank. So for this Superocean, Breitling chose to remove any seconds dial/hands, focusing solely on the ease of reading the elapsed minutes. The larger central diamond-shaped chronograph hand is actually a minute hand, hence the "slow" chronograph moniker, allowing a diver to quickly glance at their watch and know exactly how long they have been underwater. The question now is: how does a diver know/remember whether they have started, paused or reset the chronograph? Well luckily Breitling thought of that as well, as the small aperture just above the six o'clock hour cycles through three different stages depending on the activity of the chronograph. When the chronograph is active the aperture shows white, when it is paused it shows a smaller white dot and when it is reset to zero it returns to black. I've spoken numerous times about the great tool watches of the 1960s and 1970s and how they are a perfect combination of function and design, and this Breitling is a great example. A nice even patina has formed across the hour markers whilst the surrounding outer white minute track has remained surprisingly crisp given that this watch is now fifty years old. There are some very minor dings on the sides of the case and bezel but in this piece it only adds to its rugged appeal as a functional, practical watch. This piece is currently on a black leather strap however it would be my preference to swap that out for a black/cream fabric NATO to keep its original tool look. The auction estimate for this piece is £3,800 to £4,2000. Again simplicity trumps excess when it comes to design. Photo courtesy of Watches of Knightsbridge. For too long I wondered why vintage Longines were always achieving such high prices at auction, especially compared to their contemporary pieces. It was only as I went further down the watch rabbit hole (through the loupe?) that I began to understand why this was. It's a shame that the majority of people outside the watch community don't appreciate the great work that Longines was doing forty, fifty, sixty years ago. This lot is a perfect example of this manufacturing prestige. Unfortunately this watch marks the end of an era for Longines, as the 30CH chronograph movement was the last in-house movement the company produced. The 30CH was the successor to the Calibre 13ZN, which watch collector extraordinaire Alfredo Paramico said was the "finest chrono movement ever made by any watch manufacturer". This piece is a manual wind fly back chronograph with column wheel and an absolutely stunning 30CH movement on the inside. The crisp Arabic numerals on this piece are classic Longines style, legible and discreet without being overly utilitarian. The long sloping lugs of this piece will make it wear slightly larger than its 38mm case would suggest, as well as making it easily wearable despite its age. It's the simplistic nature of the design that has allowed it to age so well. In fact during my time in retail the modern re-edition from Longines was one of the most popular pieces that they produce. There is an auction estimate of between £8,000 and £10,000 on this piece and given the provenance of the movement and overall condition I expect it could easily go above this. Photograph Courtesy of Watches of Knightsbridge. Remember what I said about simplicity and toned down design? Well, forget everything about it as I love this watch in spite of its distinct lack of simplicity. This is a watch that shouldn't work on any level: its large egg shaped case, the uneven layout of crowns and pushers, clashing colours of green, blue, black and orange & the combined total of seven hands. Seven! Yet somehow all of these wacky design choices blend perfectly to create a truly unique watch. Launched in 1969 using a heavily modified Calibre 861 called the Calibre 910, the Flightmaster was specifically designed as a modern pilot's watch allowing for a reading of two time zones (three with imaginative use of the chronograph). The 52mm long, 42mm wide and 15mm deep case makes use of hidden lugs which allows the watch to fit much tidier on the wrist than could be expected. This piece is an early example from 1970, before Omega released the Calibre 911 version which replaced the 24 hour timer with running seconds. This change followed complaints that it was difficult to see whether the watch was running at a glance without activating the chronograph. Each of the functions are assigned to three crowns and pushers, each of which are colour coded with spots of lacquer matching to the respective hands for ease of use. Running clockwise around the watch, you have the standard chronograph pushers (coloured orange & yellow) the crown at three controlling the hour & minute hand, the crown at eight (coloured black) for the inner rotating bezel and the crown at ten (coloured blue) for the independent GMT hand. Despite its limited production of only five years, the Flightmaster would leave a large impact on the future design of Omega watches, especially those intended for practical use in aviation. It would serve as inspiration for the Speedmaster X-33 and it would be honoured in the bonkers digital/analog combo of the Speedmaster Z-33. I enquired with Watches of Knightsbridge regarding the white chrono central and subsidiary dial hands thinking that they might have been replaced at some point as originally the Flightmaster was only available with orange/cadmium yellow chrono hands. I was informed that under close inspection it appears that the original hands were repainted white at one point, possibly for increased visibility and if you look closely at the minute and hour sub dials you'll be able to see a hint of colour coming through (though which colour exactly I don't know). Why the original owner chose to repaint bright orange hands for the sake of visibility I don't know however it's very nice to see the original hands on this piece. I'm sure that finding the original colour wouldn't be out of the question for a determined collector. This piece has an auction estimate of between £2000-£2500, which I consider a bargain. Rolex Ref 6036 Triple Calendar Dato-Compax "Jean Claude Killy"
There are watches and then there are watches. This is the latter. A solid gold Oyster Chronograph with triple calendar complication, one of the most complicated watches that Rolex ever produced. Who is Jean Claude Killy and why is this piece known as "his" watch? Monsieur Killy is a former French triple Olympic champion who won all three alpine events at the 1968 Winter Games and also a slew of world cup championships throughout his career. Unsurprisingly as a sophisticated gentleman athlete he was welcomed into the Rolex family as an official ambassador, unlike Steve McQueen or Paul Newman who were just known for wearing them. What is odd is that his advertisements are all for the Explorer II and Datejust, never for the piece which is so often associated with him. Killy was so invested with Rolex that at one point he was even nominated to join the board. Like the Breitling Superocean, this watch is in remarkable condition for a piece that is over fifty years old. The original silver dial has remained crisp and the gold "dagger" hands only show the barest sign of age on the inner lume cutaways. This piece is powered by a Valjoux 72C movement, a staple of classic Rolex complications. I originally had concerns regarding the placement of the lume pips on this watch which rather bizarrely cover the minutes just below the chronograph track which could have been added at a later date. Watches of Knightsbridge responded by saying that it is not uncommon for different countries/markets to receive subtle variations on dial design, some with flat square hour markers or others with the gilt pyramid markers that this piece has. I have seen a few pieces online which also have this lume pip placement and given the provenance of this piece being consigned by the original owner's family and its overall condition, it not something of concern. The auction estimate for the piece is between £80,000 to £120,000. Tudor Oysterdate Chronograph Ref 7159 "Monte Carlo"
With the recent revival of Tudor, I'm not surprised to see more pieces like this having more prominence amongst auctions and dealers. 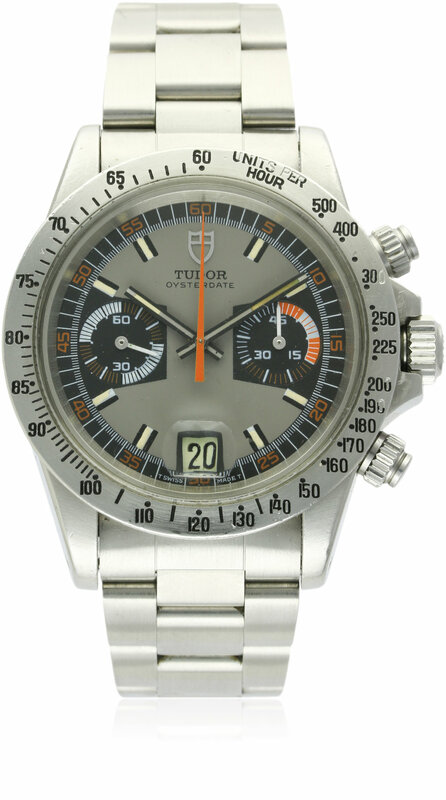 This Ref 7159 was one of the first Tudor chronographs to feature a solid matt metal bezel that is very similar to the Rolex 6265 design, with the tachymetre going up to 500. I like the chunkier seventies stylings of this piece, the mixture of rectangular hour markers, the home plate style borders around the registers and the matching hour hands and hour markers. Oh and the orange highlights, nothing says 1970s quite like orange highlights. Whilst I've never been a fan of screw down pushers for chronographs, these add a certain something to the overall look of this watch, perhaps it's the more pronounced knurl making them more distinctive. Powered by the Valjoux Calibre 234 with running seconds at nine o'clock and a forty minute counter at three o'clock, this is a watch with some serious muscle behind it. Considering that the first of the Valjoux 23 series was built in 1914 and continued production till 1974, it's a stunning feat of design and engineering to have found its way into a variety of chronographs, including Tudor and Panerai. I like the attention to detail on these dials, with the forty five minute split into three fifteens and then three five minutes for more accurate timing. This pairs nicely with the fifteen second markings on the running seconds as well. I know I said above when talking about the Longines 30CH that dial symmetry is nice, and whilst usually the addition of a date window skews that somewhat, I find that the cyclops negates that concern as it seems to raise the date away from the dial. The piece is in great condition with some loss of colour from the tachymetre markings however like most pieces of this age it's to be expected.